Gin and tonic once meant Gordon’s and Schweppes - and there’s nothing wrong with the classic combination, based as it is on 482 years of drink-making history. 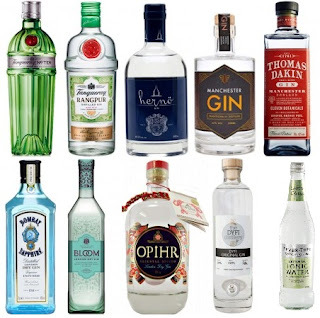 In the last few years, though, Gordon’s (founded in 1769) and Schweppes (1783) have been joined by a host of young upstarts with a daunting array of botanicals - the herbs, flowers, fruits and seeds that give a gin its distinctive flavour. In a heroic act of dedication, The Week Portfolio has sipped staunchly through a host of old favourites and new pretenders in search of the perfect G&T. “One of the most respected gins available on the market,” Tanqueray No. Ten is flavoured with “whole fruit botanicals such as fresh white grapefruits from Florida, whole limes from Mexico along with juniper, coriander and chamomile” says the Gin Foundry. Fever Tree’s Indian tonic water is an ideal match for a G&T, and with citrus to the fore, No. Ten responds well to a simple garnish of lemon or lime (or both). Its distinctive clarity makes it the “go-to choice” for a classic martini, says The Daily Telegraph. A flavoured gin (and therefore referred to as “distilled” rather than London dry), Tanqueray Rangpur is a relatively subtle example of the genre. The rangpur “lime” is in fact a cross between a lemon and a mandarin orange, which goes by various names throughout southern Asia. It does, however, impart a strong lime flavour, as well as a sweet-sharp tang of grapefruit - which requires no additional garnish in a G&T. For an even stronger citrus hit, try Tanqueray Flor de Sevilla, made with Seville orange essence. A subtle, ultra-smooth spirit, Herno would make a good gateway gin for the sceptical drinker. Produced in Sweden using organic botanicals, it adds vanilla and cassia bark to the typical London dry botanicals. A good squeeze of lemon brings it to life in a G&T, but Herno also makes a mean martini. The Cocktail Geek recommends “the substitution of vermouth with a dry sherry”. Jen Wiggins and Seb Heeley, a couple who met over a G&T, produce a gin that features 12 botanicals, including dandelion and burdock root, a nod to their respective northern childhoods. “Piney juniper and citrus stand out”, says the Gin Guide, “and are skillfully balanced with earthy notes, subtle sweetness and spice.” Manchester Gin has been awarded several gold medals in international industry competitions including a Double Gold Medal in the San Francisco World Spirits Competition, regarded by many as the most prestigious drinks competition in the world. Named after a pioneering gin-maker who worked in Warrington and Manchester in the 18th century, Thomas Dakin celebrates its history with an old-fashioned square-edged bottle and a retro label. And there’s plenty to celebrate, says the Manchester Evening News. “In 1761, Dakin was the first distiller to begin making gin again after a ban on grain spirit production was lifted,” it says, “years before household names like Alexander Gordon and Charles Tanqueray followed suit.” Joanne Moore, the master distiller responsible for today’s blend, recommends a garnish of orange peel and coriander leaf, which brings out the sweeter side of the flavour profile. It also works well a sprig of fresh rosemary. An early mover in the premium gin market, Bombay Sapphire is a descendant of Dakin’s 18th-century distillery, even if ownership of the company has changed hands a few times since. A smooth, refreshing gin, it mixes will with Indian tonic water (of course) and a garnish of lime peel, which brings out its natural pepperiness. A delicate, summery spirit, Bloom gin is flavoured with chamomile, pomelo and honeysuckle. The subtly sweet combination mixes well with Fever Tree’s Mediterranean tonic, which has a light, slightly fruity flavour. It’s “highly scented”, says The Daily Telegraph, “with whiffs of honeysuckle and-orange blossom, then oranges and rosewater on the palate. Beguiling.” Several reviewers recommend strawberries as a garnish, but a twist of orange peel works well too. This clean, potent gin, distilled in Wales, sold out in days when it went on the market in 2016. Now it’s back, with a small batch released for the run-up to Christmas. It’s a versatile spirit which pairs well with a range of tonics and garnishes. The distiller recommends bruised juniper, twisted lime peel and a sprig of dill or fennel - but there’s no shame in bunging in a wedge of lemon instead. The clean, punchy flavour also works well in a negroni. For something more floral, try Dyfi’s Pollination Gin: its fresh and fruity blend of 29 botanicals makes for a revelatory martini. As Fever-Tree’s advertising points out, if your gin and tonic is three-quarters tonic, then you might as well use a quality tonic. And the upstart British brand’s tonics are unquestionably very good. Fever-Tree offers a basic tonic as well as a range of flavoured versions that can give your gin the tweak you feel it deserves. The company’s latest release is their Refreshingly Light Cucumber Tonic Water – a cucumber-flavoured version of the popular quinine-rich mixer, which has been specifically designed to pair with floral and fresh gin, such as Sipsmiths or Hendricks. The new release is a limited edition, and adds to a portfolio of 14 mixers and tonics, which also includes an elderflower tonic and a lemon-flavoured tonic, as well as a ginger ale, cola and Sicilian lemonade.